When you score, do you count athletes that DNF, like Rob Krar did in Lake Sonoma? 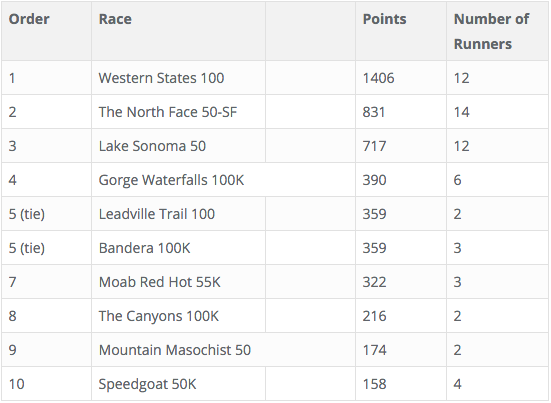 Canyons 100k does not appear to have been a competitive field for men, outside of the 1 man race at the front. I have similar doubts about the rest of the bottom half of these lists. Although lacking a single overwhelming star, JFK 50 and Cayuga Trails 50 had far more competitive fields overall. I guess it seems to me that, given the small number of elite runners who get votes for UROY, this method will tend to favor races that get 1 or 2 big names over races that have true depth of competition. There are so many phenomenally fast runners who don’t get votes for UROY, often because they run only a small number of ultras per year or because they don’t travel to compete in the western races. For what it’s worth, at the 100K World Champs there were at least 7 women who have run under 2:40 in the marathon– a giant slew of 2:40-something marathoners. At the 50K World Champs, there were at least 3-4 sub 2:40 women (including a 2012 Olympian). I haven’t looked at Two Oceans/Comrades fields– always at least a few sub 2:40 marathoners and plenty of 2:40-something marathoners. These are the most competitive Ultras in the world– none of the domestic Ultras have near the concentration and depth of fast women.